The Red Diamond team, which built the first 3.5t twin Griffon tractor ever, has decided to call it a quit. The roaring twin Griffon machine will be missed, as the 3.5t class in the NL will loose an remarkable part of it's variety and spectator appeal. Personally I find it a sad day to see such a nice V12 team (that has really worked it's way up from the very bottom) stop! At http://teammovingmountains.nl under "laatste news" - "De bouw van de nieuwe motor" you can see several pictures of them building a new Pro Stock New Holland motor. As you've probably have witnessed, there is few news on here lately. Season is over, not much happening that I am allowed to post. The other reason is, I am currently taking welding lessons from 6 to 4 each day, helping a new german team, getting stuff together for my team, write a new rule book for the german stock and hot stock classes and the "X-mas parties" of the german teams in the area have also started (so we can get them all done until Christmas), filling the weekends - to sum it up, I am plenty busy. I would like to get the sunday chat going again. It worked well before the season started and I hope we can get it going again. So: I'll try to be in the chat on sunday evenings my time (which would be like afternoon in the US). Matthias Schedlinski from Recklinghausen was so kind to send me a few pictures out of his workshop, where he is currently turning the former DSS "Roughneck" into a Pro Stock to compete in the German Pro Stock class from 2008 on. Round 2 for the Micro Monsters ! 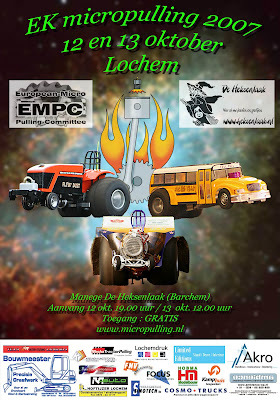 On Octobre the 12th and 13th the best micro pullers of Europe met in Lochem. The location was a camping yard for horse sport. The event took place in the hipodrom and the drivers slept at the camping yard. It was the second European Championship after the event in Rendsburg last year. Tractors from 5 nations were invited. Unfortunately the teams from Switzerland and Sweden had to cancel. Nevertheless more than 70 different remote controlled tractors crossed the starting line. Like every European Championship there is a special motivation for the drivers because of the little struggles between the different nations such as between the 2 german clubs RCTP and DMPO. The first class on the program was the 3,5kg modified. In the modified classes a high number of different engine combinations is possible. The one to beat in this class is title holder Volker Pahl with the Bad Boy. A 160 Yamada was good enough to beat RCTP Champion Ingo Krause who is powered by a smaller Yamada engine. The best performance of the day was given by Laurens Verwoerd steering Micro Popeye. The tractor with a black flag to honour Jan van Alphen shot up from the start but was not able to be controlled. Third place for the dutch tractor who is powered by 2 MVVS two-stroke engines. Martin Hausschild from Holtsee in northern Germany managed a good 4th place with the underpowered Thor. 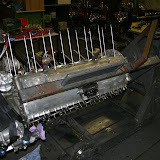 Super Stock in micro pulling means a engine limit of one cylinder. A bonnet is also chore. Most drivers use 4-stroke plane engines with about 20 ccm. Some tractors have installed a super charger for extra-power. The 3,5kg Super Stock class is a dance on the razor blade. Most times a good driver is more important than a strong motor. The most successful super stock team is Team Krause from Bistensee, also called the “Tin can army” because the tractors are not based on original super stocks. The little Hurricane copy driven by Jeroen Oltvoort was not able to use his home advantage. Ingo Krause had the strongest nerves and managed to keep his two Super Stocks between the lines. A sensational third place was achieved by RCTP President Joachim Struck Winkler with his European Maid. After a year with many ups and downs the third place at the European Championchips was a great coronation for this tractor. All three cups moved to RCTP teams. The biggest German Micropulling Club. The clock reached 10 PM and the real big engines made the warm up. 5,5 kg modified was a dignified highlight of the saturday nigh event. I will firstly present the top tractors in this class. Heat: Martin Stouten is in Micropulling something like an ingenious Gyro Gearloose. 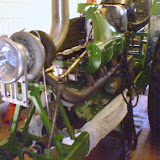 After driving a five engined tractor Martin produced self-made turbines. The model Heat is able to develop more than 7 hp. In Rendsburg 2006 he was unbeatable. Zeisig: A german tractor with a 50 ccm boxer plane engine. The DMPO Champion is always in a good balance going a direct line to the Full Pull mark. The Flying Eagle: Marien Markus was once a member of the “Van der Waal Pulling Team”. In the small sport he and his sons combine optical and technical aspects in their tractors. The dutch champion Flying Eagle is powered by three 20 ccm OS plane engines. Each one linked with a self-made centrifugal clutch. Cool Running: The new tractor of Gerco Fink is maybe the most competitive two stroke Micropuller ever. Powered by 2x 15 ccm ducted van engines about 9 hp are possible. 6 dutch and 5 german tractors reached the pull off. After half of the class was finished Sönke Koberg with his boxer engined Gigant was in front. But Volker “Zeisig” Pahl opened his carburator completely and crossed the 15 meter mark a second time. With an impressive performance Cool Running followed him to a second Pull Off. Unfortunately Martin Stouten was forced to capitulate because of broken parts in his turbine motor. In the second Pull Off Zeisig showed a perfect pull. Cool Running had problems to bring the power on the track. At midnight Volker Pahl got his 1st place cup! On Saturday morning the track was well prepaired for the smallest class, the 2,9 kg Two Wheel Drives. In this class CMB 40 engines are the top of the bill. These motors are 7 ccm two stroke model boat engines with more than 3 hp. One name on the starting list was Tom Esselink, the teenage son of Tractorpulling legend Gerrit Esselink. Unfortunately Tom ran out of bounds twice but maybe in the next years we will hear from him. In the Pull Off there was no medicin against the CMB 40 engines. Bad Attitude and The italian job reached the 2nd Pull Off. On a remarkable 3rd place was RCTP Puller Frank Siemsen from Bad Bramstedt. Frank broke his arm some weeks before and was not even sure if he could start at all. When holding his first cup in the hand he was very contented. The spectators cheered when the local guy Edwin Oltvoort beat dutch champion Harry Vink and became European Champion. In the 4,5 kg Super Stock it was like in 2006 a duel between pensioneer Franz “Leo” Kallenberg from Berling (DMPO) and Ingo Krause (RCTP). Last year “Leo” won with his Moorhuhn but in Lochem Ingo Krause showed that his Super Stocks Hunter and Mad Max are the highest level. Like in the smaller Super Stock class a double for Team Krause from Bistensee. For the 4,5 kg modified class no less than 26 starters tried to become European Champion. Unfortunately title holder Dennis Temmerman with his Cow & Chicken was not able to defend his title because he had to work. So the big question was: “Who can beat the Zeisig ?”. Volker Pahl managed a quick Full Pull. But 16 other strong competitors followed him into the finals. The one with the biggest potential to beat him was Martin Stouten with his second turbine tractor Chils Play. The blue rocket flew over the track with the quickest Full Pull of the weekend. In the thrilling pull off Zeisig reached the finish line again. All the strong tractors tried to follow him. Cool Running missed the chance for a revenge after the 5,5 because of “too much” power in it. Martin Stouten was very quickly flying down the track but 2 meters before the goal he stopped because of a damage. Nearly everybody already congratulated Volker Pahl for the title when The Cowboy crossed the starting line. The Cowboy is powered by a Zenoah motor, a model boat motor which can be compared with a chainsaw engine. Herman Staal, driving the tractor, gave full throttle and got it to the Full Pull. In the 2nd Pull Off Zeisig beat him because The Cowboy ran out of bounds. Anyway, the 2nd place was a remarkable result for The Cowboy Team. The owner is Erik Roerdink, he is sitting in a wheelchair. His team mate and tractor driver Herman Staal is 20 years old and his name should be noticed for the tractorpulling future. Now that the outdoor season is over, it's time to have a look at what is going to happen at the indoor pulls. Zwolle, Ahoy and Arnhem are all trying to attract fans from all over. Ahoy has announced Larry Roberts to be the US guest puller for 2008. Ryan's Toy 2, a Alky Burner Super Stock and "Double Stuffed", a very unique modified tractor with two IH inline 6 alky engines, will make exhibition runs in the Ahoy Stadium. Hermann has his pics of the Micro Pulling EM online! 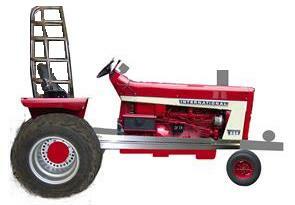 i am franklin from holland, I am currently pulling at the mttc, it is a club of 20 members with 15 tractors. it looks like the gardenpulling, but it has begun as a group of young kids, nowdays some people are building pullers almost just like the gardenpullers. My question to you is, would you be so kind to put the link of the mttc: www.mttc.nl at your site. www.picasaweb.com/franklinpiggen/oldredinterceptor . It would be very nice if you put my link on your site so people know what i am building. The french sled team has a new website! Reineir put his pictures from Hagenstein online.. Team JÆRBUEN from Norway has purchased the Black Tractor from the Netherlands to compete in the 3.5t & 4.5t modified class up north. Nice addition to the circuit there and now there is room for a new machine in a dutch workshop. Picture Album of the Garden Pulling EC is completed. Tim has shot some nice pictures and videos at Georgetown. Who can tell what is wrong in this picture??? The competitors list for the European Championships in Garden Pulling, taking place at Füchtorf this weekend, is online. Pulling team "The Judge" are also heavily investing into the future! They have already aquired a champion's steering wheel, to make sure at least this part knows how to finish first. It looks like the Innovater team from Norway has bought the old MP-Lift! Have finished the 2.5t mod today. If somebody has additional info (like I missed tractors...), please contact me!!! Update on the Green Monster Team website!